Robust Health Instead of a Flu Shot! I don’t get a flu shot. I don’t believe the risk of heavy metal accumulation and immune system interference are worth the small possibility that the drug companies have selected the exact flu viruses that I will be subject to getting. I also don’t believe I’ll die if I get the flu. So, what to do to stay healthy in winter when, it seems, everyone is coughing and suffering with some sort of illness? Well, supporting robust health to be able to fight it all off is the way I choose. For me this means plenty of sleep, exercise, and super nutrition. In winter I like to fire up my superb Super Angel 5500 all stainless steel juicer. What a great machine! I started juicing again a few days ago. 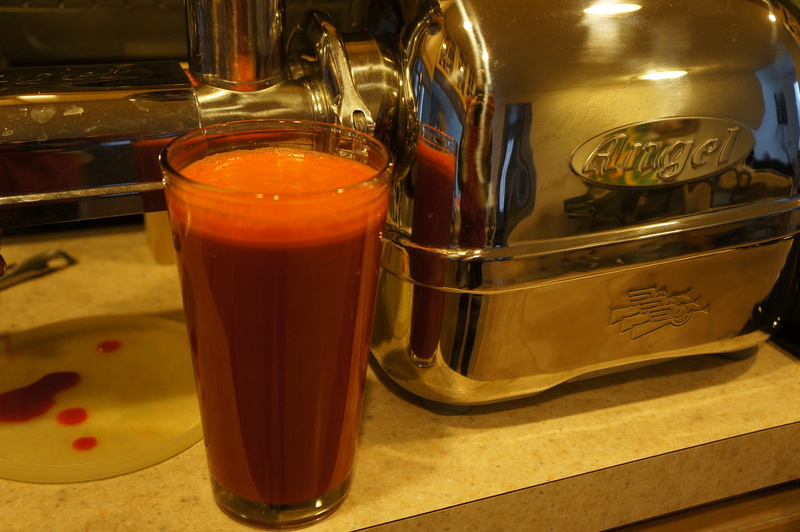 This is today’s version: 6 big fat carrots, 2 apples, 2 inches of fresh ginger, 1 small beet – all organic, of course, and this makes 2 servings. I drink mine immediately and my husband’s goes into 2 small stainless steel thermos containers in the freezer. They don’t freeze the juice, they are just super cold and hold the juice with minimal nutrient loss until he is home to drink it. This juice tastes great and I can just feel my cells soaking up all that nutrition. My body definitely functions better when it has nutrients to accomplish its needs. A strong, well-fed body will be better able to fend off any bug floating nearby! Please note: I am not giving advice to anyone else here. I am tell you what has worked for me. And I do believe in shots for things that kill you. I do keep my tetanus shot up-to-date and my dogs both have current rabies shots.